Black soldiers & white officers in Union army, 1863-1865. About 500 involved in Wilmington campaign buried here. From January 15 to February 22, 1865, Union army and naval forces engaged in the successful effort to capture Fort Fisher and take Wilmington, the South’s last significant blockade running port. Several regiments of United States Colored Troops (USCT) took part, and fought with conspicuous gallantry, taking a central role in the capture of Battery Buchanan. 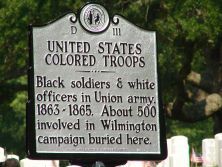 The USCT units who took part in the actions around Wilmington included the 1st, 4th, 5th, 6th, 10th, 27th, 37th, and 39th regiments. In their ranks former slaves, as well as free blacks, in addition to their white officers, from across the nation, served. The 37th USCT had been raised in coastal North Carolina, and included men from Bladen, Brunswick, and New Hanover Counties. Casualty figures for those USCT units engaged in the actual taking of Fort Fisher were very low, due to their taking part in only the final stages. Nevertheless, they faced a determined enemy and potential execution if they were captured. Chaplain Henry M. Turner of the 1st USCT, who took part in the battle, asked several captured Confederate officers whether they killed black prisoners. The officers replied that if the blacks were free men, they would not, but if they were former slaves and could be identified as such, “they were treated as house burners and robbers.” Chaplain Turner, who was black, was also told that “as for you, you would be treated the same as any of the Yankee officers,” suggesting that he would have been killed. Wilmington National Cemetery records the wartime burials of 92 identified members of the USCT, including not only those who died in the Fort Fisher campaign, but also a number who succumbed to disease in 1865 while serving in Wilmington. 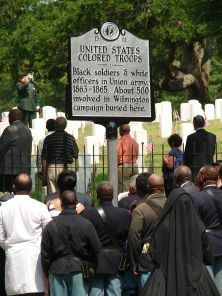 Several hundred USCT soldiers' remains were moved to the cemetery between 1867 and 1882. Records indicate that nearly 500 USCT men were buried in the cemetery, the vast majority in unmarked graves.